The name ankylosing spondylitis is derived from Greek roots angkylos = ”bent” (although the word ankylosis now means joint stiffening or fusion) and spondylos = ”spinal vertebra”. It is a chronic, inflammatory rheumatic disease with a prevalence of about 0.5% in epidemiologic studies in Europe, but the prevalence can vary in other populations. It is the prototype of a group of diseases that share clinical and pathogenetic features and are grouped under the term "Spondyloarthritis" or "Spondyloarthropathies" (SpA). This term includes, in addition to AS, reactive SpA, psoriatic SpA, enteropathic SpA (associated with Crohn's disease and ulcerative colitis) and undifferentiated SpA. These diseases can occur within families because of a strong genetic predisposition highlighted by its strong association with HLA-B27, a normal gene that is also present in a small percentage of the general population. 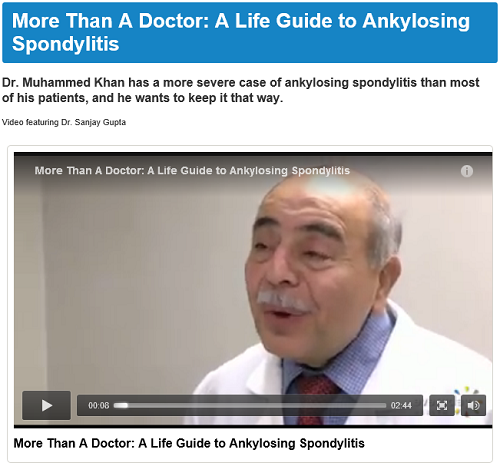 For Patients: What is Ankylosing Spondylitis in a Nutshell? Ankylosing spondylitis (or “AS” for short) is a chronic (progressive) painful inflammatory rheumatic disease which affects the spinal joints, in particular those at the base of the spine (the sacroiliac (SI) joints and the lumbar spine), with resultant chronic back pain and stiffness. These symptoms typically start at young age, beginning between the ages of 15 and 30; the mean age of onset is 24 years (range 8-45). It is very uncommon for the symptoms to begin after age 45. The most common first symptom is chronic low back pain and stiffness of gradual (insidious) onset. It can take many years, on average about 7 years, before the correct diagnosis. The disease, over many years, leads to gradually progressive stiffness and limitations of spinal mobility and also restricted chest expansion. It can affect other joints besides the spine, in particular the hip and shoulder joints, in some patients, especially when the disease starts in childhood. Involvement of these and other joints of the extremities is relatively more common in developing countries. Approximately one third of the patients can get one or more episodes of acute inflammation of the eye (acute iritis, also called acute anterior uveitis). AS has characteristic x-ray findings, especially changes that result from inflammation of the sacroiliac joints of the pelvis (sacroiliitis). Unfortunately, x-ray evidence of sacroiliitis may take some time to appear. Therefore, an x-ray taken in the early years of the disease course may be normal or indefinite (equivocal). However, over time the SI joints will usually show evidence of sacroiliitis. Its cause is not yet fully known, but there is a strong genetic predisposition; the disease sometimes occurs in more than one member in a family. A gene called HLA-B27 is present in most patients with AS; e.g., >90% of Scandinavian, Chinese and Korean patients, about 80% of European and South Asian patients and 70% of Arab patients as a whole, and less often in some other population (e.g., only above 50% of African-American patients). This gene is prevalent in the general population with variable prevalence; e.g., in the general population in the USA this gene is present in 7% of the “whites” and 2 to 3% of African-Americans. The genetic disease predisposition to AS is polygenic; i.e., there are many genes involved, not just HLA-B27. The search is now on for these additional genes and also for the trigger factor(s) (as yet undetermined) that start(s) the disease process. There may be an associated presence of psoriasis, chronic inflammatory bowel disease (ulcerative colotis and Crohn’s disease) and Reiter’s syndrome/reactive arthritis in some patients. There is no cure as yet, but the patient’s back pain and stiffness usually show good symptomatic response to non-steroidal anti-inflammatory drugs (such as diclofenac, naproxen, ibuprofen, etc.) and a regular life-long appropriate physical exercise program. TNF-α inhibitors (such as etanercept (Enbrel®), infliximab (Remicade®), adalimumab (Humira®) and golimumab (Simponi®) have remarkably transformed the management for those patients who do not respond to (or tolerate) conventional therapies. While the course of AS is quite variable, most patients do well and continue to live normal and productive lives. However, some need to modify their lifestyle and work environment, or change their job (e.g., heavy manual worker doing frequent or prolonged bending and lifting may have to consider an alternative job).